Author: Anthony Yeates at Durham University. Computer modelling of the Sun’s magnetic field is undergoing a quiet revolution. For half a century, we have been able to measure the magnetic field strength on the solar surface (the photosphere), and from this extrapolate the magnetic field in the overlying corona. But the traditional thinking – that one can extrapolate the coronal magnetic field using only the photospheric data at a given instant – is running into trouble. Sophisticated “force-free” models that contain free magnetic energy to power solar flares and eruptions are difficult to extrapolate uniquely from the available data. We argue that the only practical way around this problem may be to generate coronal magnetic models not by static extrapolation but by time evolution. We have developed coronal magnetic simulations that are fundamentally time-dependent, based on the magneto-frictional model . This is designed to capture the qualitative evolution of the real coronal magnetic field, namely quasi-static evolution through a sequence of force-free equilibria in response to changing photospheric boundary conditions. The quasi-static assumption simplifies the computations, making it feasible to simulate the coronal magnetic evolution over many months or years, while still accounting for the time-dependent build up of magnetic structure. Figure 1: A magneto-frictional simulation in August 2011. Coloured lines show coronal magnetic field lines, and the photospheric radial magnetic field is shown in greyscale (white positive, black negative). 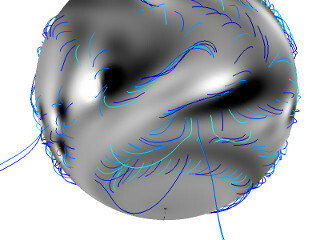 Figure 2: Snapshot of a magneto-frictional simulation showing the low-coronal magnetic field patterns above polarity inversion lines. A long twisted flux rope is evident at one location. Although the magnetic distribution on the solar photosphere changes greatly from one month to the next, the nature of the coronal magnetic evolution means that “imprints” of previous magnetic structure may remain in the corona for much longer. In other words, the coronal magnetic field has a memory. In the magneto-frictional model, these imprints tend to take the form of horizontal magnetic field, rather than vertical (radial). As opposite-polarity vertical magnetic flux cancels at photospheric polarity inversion lines, horizontal magnetic field is left behind in the corona. This leads to the gradual build up of horizontal field concentrations above the polarity inversion lines. Because of the way that magnetic reconnection takes place during the cancellation, these often form twisted “magnetic flux ropes” [1,3]. Roughly speaking, these flux ropes concentrate and store up the net horizontal fields that emerge or form in the corona over time. They are a manifestation of the coronal memory, forming naturally in the magneto-frictional model but difficult to reproduce in static extrapolations. Can we observe this memory? You don’t see coronal magnetic flux ropes by looking at photospheric magnetograms, but modern observations of the corona in a range of wavelengths mean that the existence of coronal flux ropes is now widely accepted by solar physicists. In particular, dense coronal structures known as filaments have long been known to form above polarity inversion lines . Since these structures are denser than the surrounding corona, it has been possible (though challenging) to measure their magnetic fields directly. And it is found that the magnetic field is primarily horizontal, aligned with the filament axis and along the polarity inversion line. So filaments seem to be visible manifestations of the Sun’s memory. 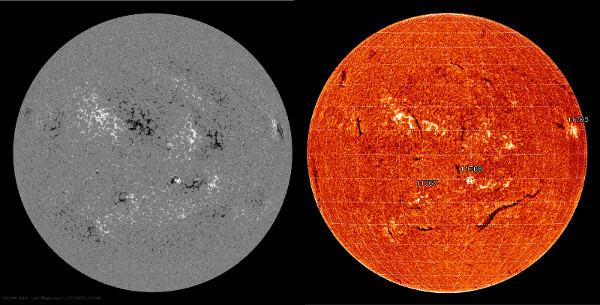 Figure 3: A photospheric line-of-sight magnetogram taken on 12 June 2013 by SDO/HMI (left), and an H-alpha image on the same day from Kanzelhohe Solar Observatory (right). Filaments appear as dark lines in the H-alpha image. Filaments have been a valuable test of the magneto-frictional model. In the 1990s, work by Sara Martin and collaborators showed that filaments have either left- or right-handed structure when seen against the solar disk in the H-alpha wavelength [see 1]. Moreover, this chirality (handedness) matches the direction of the magnetic field in the filament axis, with respect to the underlying surface polarities. By determining the chirality of many individual filaments from H-alpha observations, we were able to show that the magneto-frictional model can reproduce the correct distribution of horizontal field direction at these locations . How long is the memory? Our recent 15-year magneto-frictional simulations suggest that the coronal magnetic memory may last for much longer than the lifetime of an individual active region – up to several years in fact [3,4]. This is perhaps surprising, because flux ropes often strengthen to the point of losing equilibrium, and are ejected from the corona. On the real Sun, these are seen as coronal mass ejections (CMEs), and ejections happen in the magneto-frictional model too. However, our simulations require a running time of at least two years to build up the correct filament chirality on the high-latitude “polar crown”. This suggests that memory of previous magnetic structure persists for several years in the corona, in spite of flux rope ejections. Mackay, D. H., Karpen, J. T., Ballester, J. L., Schmieder, B., and Aulanier, G. (2010), Physics of solar prominences: II – structure and dynamics, Space Sci. Rev., 151, doi:10.1007/s11214-010-9628-0. Mackay, D. H. and Yeates, A. R. (2012), The Sun’s global photospheric and coronal magnetic fields: observations and models, Living Rev. Solar Phys., 9, 6 http://www.livingreviews.org/lrsp-2012-6. Yeates, A. R. (2014), Coronal magnetic field evolution from 1996 to 2012: Continuous non-potential simulations, Solar Phys., 289, 631 doi:10.1007/s11207-013-0301-0. Yeates, A. R. and Mackay, D. H. (2012), Chirality of high-latitude filaments over Solar Cycle 23, Astrophys. J., 753, L34 doi:10.1088/2041-8205/753/2/L34. Yeates, A. R., Mackay, D. H., and van Ballegooijen, A. A. (2008), Modelling the global solar corona II: Coronal evolution and filament chirality comparison, Solar Phys., 247, 103 doi: 10.1007/s11207-007-9097-0.